How far are you willing to go for a job? If the answer is "a really long way," you should know that the Legal Profession Blog reported yesterday that a law school in Almaty, Kazakhstan, is looking for a dean. Doctoral degree in Jurisprudence/Law; a clear educational vision for an effective, rigorous, comprehensive Law program, following American models; administrative experience, preferably at Chair or Dean level, at an institution of higher education; experience in curriculum development and review; excellent negotiation, communication, organization and leadership skills; and, fluency in English. The Institute is modeled after a U.S. university, even to the point of having its own American-football team, the Titans. (Since this is said to be "Kazakhstan's only university American football team," the road schedule must be pretty daunting.) All courses are in English. Interested in attending? Almaty is a city of about 1.2 million and is the commercial center of the country. Residents are only 30 minutes to the north of a 20,000 mountain range, "and 30 minutes from the dramatic emptiness of the vast steppe that runs north to Siberia." (Congratulations to the marketing person who managed to make a "vast emptiness" sound somehow appealing.) The Institute itself, based solely on its website, seems like a respectable place, although it was founded by the country's president, Nursultan Nazarbayev, who is a nut. Tuition fees for the LLM program are 41,400 tenge per credit-hour, for a total of just under 1.5 million tenge. I have no idea how much that would be in dollars but it sure seems like a lot of tenge. On the other hand, the student dorm has its own hairdresser, who is described as charging "very democratic prices." 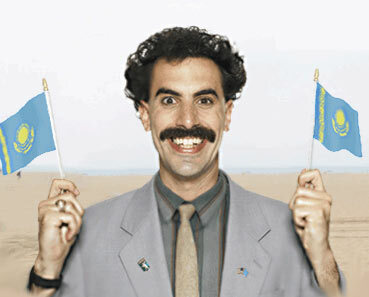 Important Note: please do not confuse Kazakhstan with Kyrgyzstan. Although there are job opportunities there right now too, like the presidency.